We have exciting news! Soon, Toluna will begin sending survey invitations by SMS text messages. 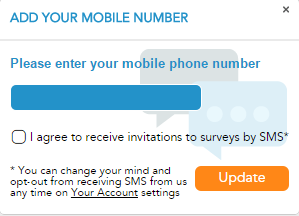 The new SMS survey invitations will only be sent for select surveys that are specially-formatted for mobile phones, and they will not be sent for every new survey on Toluna. Interested in receiving survey invitations by SMS? Simply enter your mobile phone number on the homepage and you will be added to our database to receive mobile survey invitations. If you sign up for SMS invitations and later change your mind, don’t worry. Simply unsubscribe from SMS invites in Your Account settings. Have any questions for us about SMS survey invites? Contact us or leave a comment on our topic here.